Western North Carolina offers visitors and residents alike a beautiful environment with a laid back atmosphere. 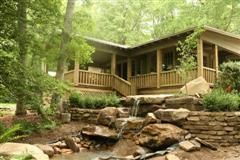 The communities of Cashiers and Highlands are areas which offer exposure to the fabulous Blue Ridge Mountains. Yellow Mountain, Rock Mountain, Chimney Top and Whiteside are mountains which offer unparalleled views and spectacular hiking, rock climbing and mountain biking. Whether you wish to sit and relax while you read a book and breathe in the fresh mountain air or hop right in and enjoy the plentiful recreational opportunities, Highlands and Cashiers have a great deal to offer. A slower pace of life, the great outdoors and a mountain lifestyle are what draw visitors to become homeowners in Highlands and Cashiers. People come to Western North Carolina and don’t want to leave. Purchasing real estate in Highlands and Cashiers can offer a full time, mountain lifestyle or a respite to get away to.